Grand Hyatt Seoul, located atop Mt. Namsan will be presenting a grand New Year's Eve fireworks display, unlike any other, in celebration of the New Year on Dec. 31, 2005. Join us in counting down the final moments of 2005 and welcoming in 2006 with this fantastic fireworks display. 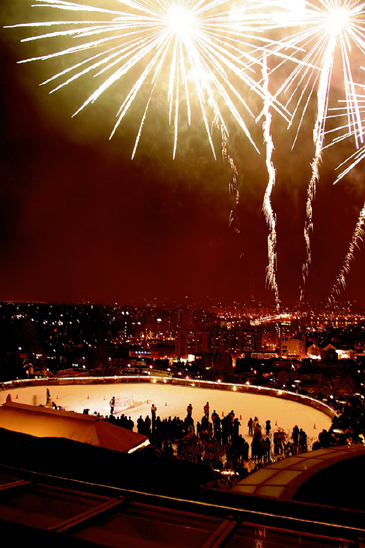 Just make reservations for the hotel's "Firework on Ice" Event Package at the Grand Hyatt Ice Rink. The package includes an evening of exciting outdoor skating starting at 6:00 p.m. and continuing until 2:00 a.m. the next morning. It also features a sumptuous dinner buffet, a remarkable skating exhibition by the Korean national skating team, propose game for couples, a variety of games and lucky draws, and much, much more. And its only 60,000 won (adults) and 44,000 won (children) inclusive. Or if you'd like to ring in the New Year's in style, why not take advantage of Grand Hyatt Seoul's Year-end Room Package? The package includes Deluxe Room accommodation for one night on Dec. 31, a 20 percent discount on the "Firework on Ice" event package at the Grand Hyatt Ice Rink, free admission to JJ's year-end party, a 50 percent discount on Sauna admission, free use of the Club Olympus gym & indoor swimming pool, and a special welcome gift. The year-end room package ranges from 232,000 - 269,000 won exclusive of tax and service charge. For further information or reservations, please call 02-797-1234.